One of the principle aims of supply chain management is managing uncertainty. And no function is more at the forefront of that endeavor than demand forecasting. The challenge of effective supply chain management is to deliver on ever-increasing customer demands for excellent service while simultaneously managing costs. Agility and responsiveness, aligned with cost-effectiveness, is the aim. In order to do that, forward planning is key, and accurate forecasts are a critical input. Where lead times are long and product complexity is high, understanding demand and reacting to the needs of the market becomes even more crucial. The quest then lies within forecasting, which seeks to provide the best possible estimate of future sales to enable the organization to effectively plan to meet that future requirement. Given that demand can change every day, forecasting becomes the ultimate adventure. As a general statement, focus on demand planning has grown in recent years as the challenge of understanding market requirements has become ever more complex. Irregular demand, as a consequence of changing customer requirements, now makes operating in new and volatile emerging markets essential to business growth. Then, if you add additional requirements around new product introductions as product life cycles shorten, the need for effective demand management skills becomes even more complex. This article seeks to explore some of the characteristics of effective demand planning and will look at how these differentiators can be applied to improve this most critical of disciplines. It’s worth noting that there is no golden bullet or secret nugget of wisdom that will deliver the promised land of a perfect and reliable demand signal. Forecasting is an alchemy of science and creative insight, and those organizations who have been most successful have developed a strategy that encompasses a drive towards good demand planning aligned with strong supply chain design that effectively manages inherent uncertainty in the demand signal. There will never be a perfect process or perfect algorithm to solve for the many levels of continuous uncertainty. But there is at least some good guidance you can follow to minimize the pain. Understanding your products and appropriately segmenting them is a critical starting point as you journey towards a more mature and effective demand planning operation. At a minimum, this requires understanding which products are most crucial to the financial well-being of the business and will provide the enhanced focus for the organization. As the process matures, other dimensions become equally, if not more important. At the top of this list is volatility. Volatility is defined as a measure of sales variability and is a central determinant of how easy an item is to forecast. Highly volatile sales make statistical analysis difficult, and so, for these items, commercial and marketing insight is key. Volatility, in conjunction with sales value or volume, can provide a simple model and help guide the Demand Planner on how best to approach the task of forecasting items as shown in the attached quadrant. Sensible businesses will focus their efforts on those areas which have the biggest impact on the economic viability of the enterprise going forward. In the case of forecasting, driving towards a best-in-class statistical operation for items with low volatility and high sales value makes the most sense. However, this must be done while simultaneously looking for innovative approaches to better understand the drivers behind unpredictable sales patterns on items with high value/ high volatility characteristics. These items provide a special challenge requiring a detailed understanding of exactly what drives sales. As the demand planning capability matures, it’s this quadrant where techniques such as demand sensing and customer collaboration should be considered. What may be driving volatility in this quadrant is whiplash at the front end of the supply chain, and therefore complex arrangements such as collaborative planning, forecasting, and replenishment (CPFR) may be used. 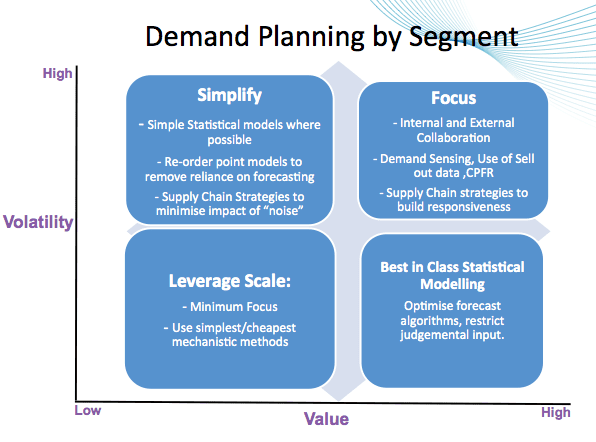 The segmentation model should help to guide the forecasting approach, but this also needs to be built into the end-to-end supply chain design. Flexibility and agility may be required to meet the need for responsiveness on items where sales value is critical, but where volatility makes accurate forecasting difficult. Elsewhere, an organization may decide that for less critical items, attempting to predict sales in the face of wild fluctuations makes no sense and it's better to hold stock to offset variability and simply revert to a make-to-order model. It seems all too obvious that an effective demand planner is intrinsically hooked into and fully conversant with the marketing strategy of the products that they forecast. As we said earlier, forecasting is in the alchemy of the statistical projection of past sales trends aligned with insight into customer behavior. As such, it is critical that the Demand Planner is an expert in both mathematical modelings and in evaluating qualitative overrides. This ensures interventions provide value-added impact on the accuracy of the forecast. The process starts when history is analyzed and cleansed to remove events that are not likely to be replicated in the future, and therefore won’t affect the overall trend. These events may include things such as a stock-out, one-off promotion, a competitor situation or even a major political or environmental event unlikely to be repeated. Likewise, as a statistical model is developed, an understanding of the product features will heavily influence choosing the right algorithm. Is there a definite trend? Is this a seasonal product? Is something happening with the product that requires us to dampen the trend? All of these considerations will help determine which model should be applied. And insight into the behavior of the product and what impacts its sales will guide the Demand Planner towards choosing an appropriate way to forecast. As you might suspect, Demand Planners with these skill sets don’t grow on trees. Accurate forecasts need to balance sound statistical process with qualitative insight that takes into account the knowledge of experts both inside and outside the organization. Developing a consensus-driven demand plan sensitive to commercial opportunities and risks, amassed through close collaboration between both internal and external partners, is critical to ensuring key opinions are understood and considered. This is both an opportunity and a challenge, as aligning a commercial aspiration and a financial target is not easy, particularly when the different functions involved may have a very different focus, and quite possibly conflicting objectives. This task gets exponentially more difficult when external partners become involved. But external partners should also not be ignored as they build in a useful check and balance system if managed correctly. Bringing these views together in a way that adds value to the forecasting process is a challenge, but it is crucial that these opinions are incorporated into the numbers. Managing this effectively requires that cross-functional management structures within the organization effectively measure the process to ensure the collaboration has a positive impact and shared objectives. Often, an internal demand management review, held as part of the S&OP cycle, becomes an effective vehicle for bringing these groups together to finalize the demand plan whilst simultaneously reviewing the impact of the consensus forecast on the integrated business plan. The challenge of collaborating across functions requires both common goals and joint accountability. It’s important that all stakeholders in the process support the aim of creating an accurate forecast of demand, free from the bias of other drivers such as sales targets or financial plans. Shared objectives, clear accountability, and honest and accurate measurement and performance reporting will help this. Beyond that, there is a need to consider how to best structure the demand planning organization to facilitate the building of competency in the group. In global companies, the demand planning capability is likely to be dispersed across multiple regions and the capability/maturity of the function may vary. Building maturity across a disparate group is not easy. Centralization provides the opportunity to create a consistent level of capability, but it also has drawbacks as it takes the forecasting process further away from sales insights and risking losing collaborative elements. Alternative models, where aspects such as the statistical forecasting are done in a center of excellence whilst commercial market intelligence remains localized, are an alternative option. Choosing the right approach requires focused thinking. One size invariably does not fit all across a large organization, and there is a need to consider the balance between how to build technical capability and requirements to be close to the sales action. The right model is likely a combination of multiple dimensions across the spectrum and may include market, product, sales, and financial characteristics. In any alchemy, the most difficult variable to manage is inevitably the people. Attracting, training and retaining highly skilled demand managers is a key feature in building a mature demand planning process. Often, the first step is the creation of a formal demand planning role and providing the right framework within that role so personal mastery in the discipline can be developed. This challenge links back to our earlier organizational design discussion, where consideration for competency and skill development for new roles can dramatically change career trajectories. A centralized structure, such as a center of excellence, can help alleviate this issue, as it is both a fertile ground to build the capability and is poised to enable career pathing that encourages technical mastery of forecasting. Developing people capability is hard, and as organizations embark on a roadmap to build excellence into their demand planning function, assessing the current level of capability and defining a strategy and a roadmap to grow this particular element is key. A people maturity model is strongly suggested. Last, but not least, and crucial to the journey towards excellence in demand planning, is a clear understanding of how well you are performing. Having the right metrics to measure both the accuracy of the forecast and provide targeted insight into the impact of the demand planning process against KPIs is crucial. It’s not enough to just measure forecast accuracy. An understanding of the value provided through marketing and financial adjustments enables us to more clearly understand whether the forecasting process is having a positive effect beyond just a simple projection of sales trend. These metrics ultimately enable the organization to “learn for the future”. We began by highlighting the challenge of managing uncertainty. Forecasting aims to support the supply chain by providing the most accurate possible estimates of likely future demand to enable the supply organization to be as responsive as possible, and in the most cost-effective way. Striving for the most accurate projection possible is the goal of the demand management function. Planning for the limitations of this process and understanding that 100% accuracy is not attainable, such that effective supply chain strategies are constructed to cope with variability of the demand signal, is the challenge E2E planners need to design into their networks. Needless to say, forecasting in the supply chain space is indeed an adventure. Sadly, it comes with no guaranteed roadmap, nor does it ensure you will reach your destination month after month. There is never a dull moment and there is ALWAYS a good story to tell -- much like all good adventures.